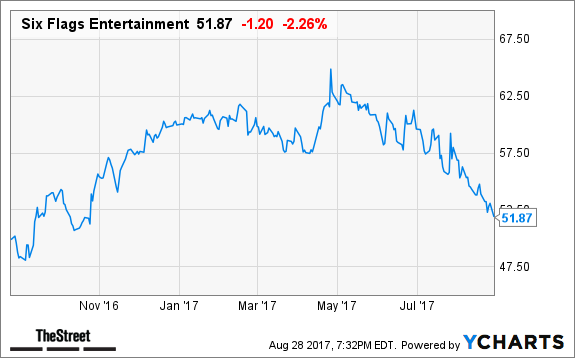 For an "Executive Decision" segment, Cramer welcomed back Jim Reid-Anderson, chairman, president and CEO of Six Flags Entertainment Corp. (SIX - Get Report) , the amusement park chain with shares that are off 13% so far in 2017. Reid-Anderson started off by saying that while Six Flags does operate three parks in hurricane-stricken Texas, it has 20 parks overall that operate year-round, so the financial impacts from any one event are minimal. He wished all those in Texas a speedy recovery. Turning to the company's most recent quarter, Reid-Anderson said that while they did miss analysts expectations this quarter, they did post record revenues and earnings. He said they can, and will, do better, however. Reid-Anderson also noted that his return as CEO of the company was purely coincidental and did not have anything to do with this quarter's performance. Looking ahead, Reid-Anderson said Six Flags has huge opportunities in a great industry and his company's 5.1% yield is the highest in the industry. He also noted this past last summer has historically been a great buying opportunity for their shares. Cramer and his team are focusing on how Hurricane Harvey is affecting the markets and the AAP portfolio, particularly energy holdings. Find out what they're telling their investment club member and get in on the conversation with a free trial subscription to Action Alerts PLUS. On Real Money, Cramer says don't overthink the winner in this new iPhone iteration. It's Apple (AAPL - Get Report) . Get Cramer's insights with a free trial subscription to Real Money.